We've probably seen about a gazillion (yes, that's an approximate figure) iterations of watermelon nails, but damned if this cool wrap from Scratch doesn't blow all the others right out of the water. Made as part of a collaboration with Burkatron's Caroline Burke, the reason these melons are so superior is in their imprecision. The haphazard squiggles of the "seeds," the simple colorblocking of the pink, green, and white — it all adds up to one seriously stunning summer nail that actually looks like we painted it ourselves. We wish our hands were that steady. In fact, we're kind of obsessing over all of the designs on the site right now. There's a twee Peter Pan collar that has Zooey Deschanel written all over it, plus an artsy Baroque pattern that's all kinds of major. For those of you not yet familiar with Scratch, it's an indie nail wrap brand that partners up with a "Featured Artist" — a blogger, illustrator, designer, or nail artist they admire — to launch a limited-edition collection of wraps. The goal of the brand is to allow artists to share their art through a new medium, while providing fresh designs that go beyond the usual played-out patterns (we're looking at you, glitter animal prints) on the mainstream market. While Burke's collection is wrapping up (get those designs while they're hot, girls), this week the brand launched a new batch of decals with blogger Kaylah of The Dainty Squid. Her trio of colorblocked wraps are on sale now, so if you like your nail art a little less fruity, these will be right up your (artistic) alley. 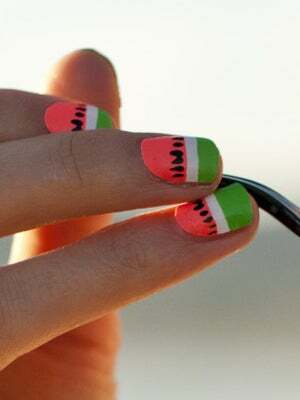 Are you loving this melon mani as much as we are? Scratch Watermelon Nail Wrap Set, $12, available at Scratch.